Here’s a common question that has come again this fall. What’s wrong with my turf? Is this a disease? The answer is frost damage. This is an interesting example because it has such a curious design. Bermudagrass, especially tiff, will have this appearance after the early frosts that hit when the turf is still green. Warm-season grasses in general don’t like low temperatures. 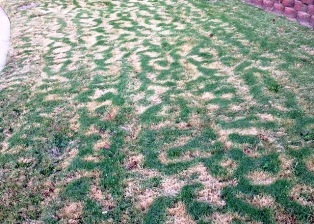 Some will show off color because of chilling stress that might start at 54-60 degrees F. Early chilling damage can appear as a general tan color or this blotchy mottling of the turf. It’s nothing to worry about. It’s getting cold and this is normal and non-damaging. I’ve seen this manifest in organic as well as synthetically maintained lawns.